Thus begins The Tale of Peter Rabbit, Beatrix Potter’s most loved children’s story. With these words, Beatrix Potter awoke the minds of millions, and created some of the greatest literature English has ever known. Her entrancing letters were accompanied by striking illustrations and fantastic characters, from cheeky Peter to silly Jemima Puddleduck, the mischievous birds and fat squirrels of Timmy Tiptoes and the brightly coloured snippets of the Tailor of Glouchester. Little did Beatrix Potter know what cute little plush toys these animal characters would later make! 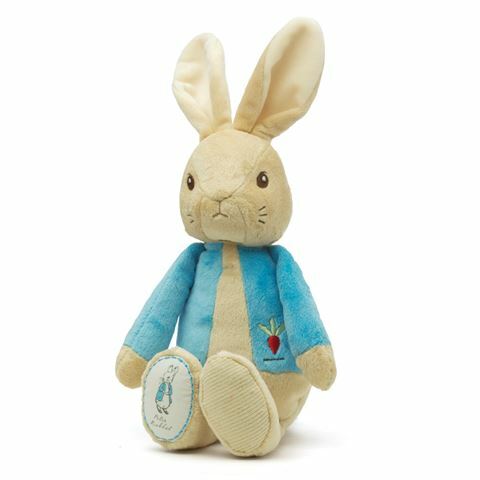 The My First collection of toys features the familiar faces of Peter and his siblings the Flopsy Bunnies, made from wonderfully plush fabric that makes them extra cuddly. Here comes Peter now!And here comes Peter now! He wears his familiar little blue vest, but his shoes seem absent yet again… Maybe after a few lettuces, he’ll be ready for bedtime? Suitable for children from infancy. Made from super soft velour. Stitched details leave no parts for young ones to chew on. Height: 34cm (Including Ears, When Standing).